This book has set the standard for JCL training since its first edition in 1980. Now, it’s more modular than ever so it lets you teach just those skills that your students need. And, yes, it will outperform (by far) any training materials that are available from IBM. This is far more than a JCL book, though. Besides JCL, it does a great job of introducing the IBM mainframe environment, which is so foreign to anyone who has been working on another platform. That’s why some instructors use this book just for that purpose. In addition, this book presents VSAM data management and Access Method Services, OS/390 utility programs, the sort/merge utility, TSO, CLIST, REXX, and Unix System Services. Since the 1960s, the OS operating system in its various releases has been used to run IBM mainframes. 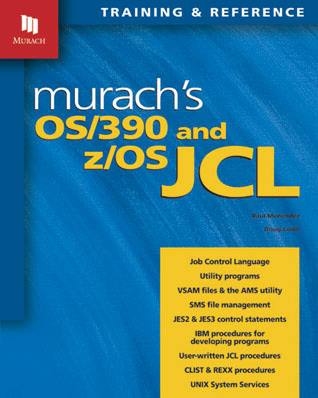 This book was written for the current edition of OS, z/OS, and its immediate predecessor, OS/390. But because IBM software is upward-compatible, everything in this book should work on subsequent releases as well. Job Control Language, or JCL, is the language that controls the operating system. So if you’re working as a programmer or operator on a mainframe, you need to know JCL. Although programmers often get by with minimal JCL skills, the best programmers develop a solid set of JCL skills because it helps them get more done in less time. The primary goal of this book is to teach JCL. But along the way, your students will learn how to use many of the facilities of z/OS and OS/390, including ISPF, Access Method Services, utility programs, the sort/merge utility, TSO, CLIST, REXX, and Unix System Services. When your students finish this book, they’ll have a rich view of what the operating system can do, and they’ll understand why those capabilities are required on the job. This section introduces the IBM mainframe environment so your students will know how the JCL that they code affects the system’s processing. They’ll also see how OS/390 and z/OS build on earlier operating systems, and why the JCL they learn today will work for many years to come. Here, your students will learn how to code the JCL they’ll use every day on the job to run programs that process disk, tape, and print files. They’ll also learn how to create and use stored procedures, which can save dozens of lines of JCL coding. This section presents the time-saving JCL features that programmers use regularly, but not every day. That includes error handling techniques, generation data groups (GDGs), and SMS (the Storage Management Subsystem that takes care of many file-handling tasks automatically). This section shows how easy it is to code the JCL for jobs that use VSAM files. Then, your students learn how to use AMS (the VSAM utility) to create and manage VSAM files, including how to create alternate indexes for key-sequenced data sets. This section shows how to use some of the work-saving tools that OS/390 and z/OS provide for program development, including: compilation procedures; utilities for jobs like sorting and copying files; procedure building tools like CLIST and REXX; and Unix System Services, a facility that lets you access files designed for Unix systems. The three chapters in section 1 introduce your students to mainframes, the operating system, and ISPF. This is the introduction that every student needs because no other platform is like a mainframe. Chapter 4 teaches a subset of JCL that will get your students started right. Then, they can build on that subset in the five chapters that complete section 2. When they finish this section, they will have better JCL skills than most professional programmers. After your students complete the first two sections of this book, you can assign sections 3, 4, and 5 in whatever sequence you prefer. You can also assign the chapters in sections 3 and 5 in whatever sequence you prefer. That’s because these sections and chapters are designed as independent modules. Throughout the book, hundreds of examples show the right way to code JCL for specific operations. These examples clarify the critical decisions that programmers have to make so they can avoid the errors that cause jobs to fail. Besides showing how to code the JCL for an operation, this book gives the background for knowing why an operation should be coded that way.